This paper explores the basics of fire and explosion safety issues, legislation, regulations and global standards, and compares Class/Division Hazardous Location vs. Zone Hazardous Area Classifications and Protections primarily for Oil & Gas Refineries, Chemical Processing, Transport Operations, Oilfield Equipment and Services. 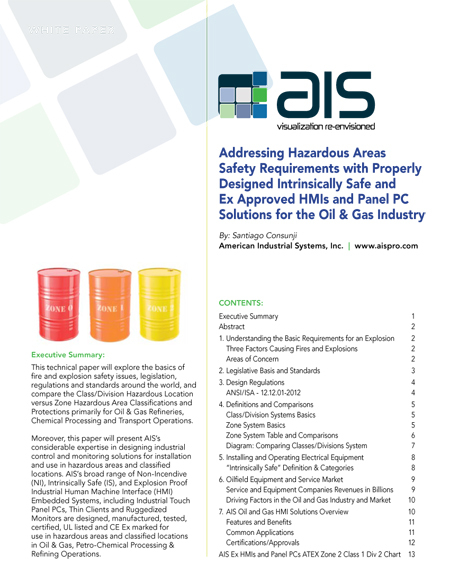 AIS’s broad range of ATEX certified HMI Embedded Systems, including Industrial Touch Panel PCs, Thin Clients and Ruggedized Monitors are designed, manufactured, tested, certified, UL listed and CE Ex marked for use in hazardous areas and classified locations. Technology is touching more people’s lives every day. 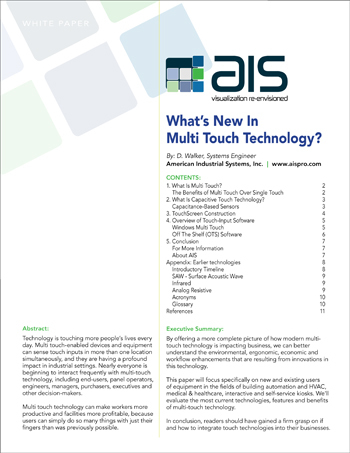 Multi-touch-enabled devices and equipment can sense touch inputs in more than one location simultaneously, and they are having a profound impact in industrial settings. Nearly everyone is beginning to interact frequently with multi-touch technology, including end-users, panel operators, engineers, managers, purchasers, executives and other decision-makers. Projected Capacitive Multi-touch Technology can make workers more productive and facilities more profitable, because users can simply do so many things with just their fingers than was previously possible.